Pierre-Benoît Dumont tried many different careers before embracing a career as a painter and adopting stencilling as his technique. He wrote poetry and theatre pieces and explored cinema and comic books. 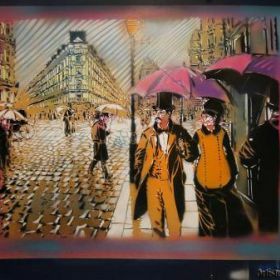 He started painting with stencils in 1993, and decided to take up the name "Artiste Ouvrier" in 2000. Artiste Ouvrier's stencils include a high level of minute detail and often make use of colour. Contrary to other artists who use colour with stencils he never uses more than two stencils for a single work, yet he sometimes uses as many as 48 colours. His major influence is 19th century art, particularly the pre-raphaelites.